Present state: The station house which incorporates the station building still stands and is now a private residence. The condition of the platform is unknown. 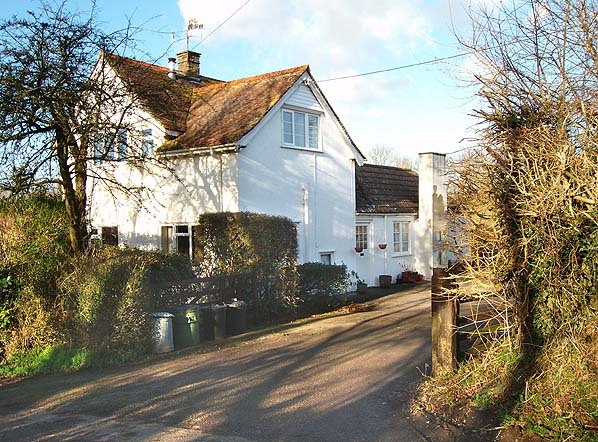 Notes: Combpyne station was sited on a sharp bend at a point where the line changes from a southerly to an easterly direction into Lyme Regis. Initially the station had an island platform with the only passing loop on the line. The platform was bleak with no faculties of any kind other and a single bench, oil lamp standard and a running-in board at the north end. 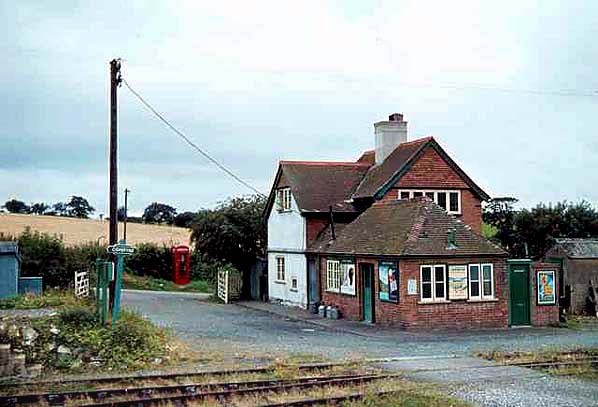 The booking office was on the far side of the up line and comprised a single-storey rectangular brick building with a hipped tiled roof at right angles to the platform, adjoining the two-storey stationmaster’s house. Passengers used a barrow crossing at the south end of the station to reach the platform, there was a second lamp standard by the crossing. The platform was originally faced with timber but was later refaced with concrete. passenger trains using the down side of the former island platform. 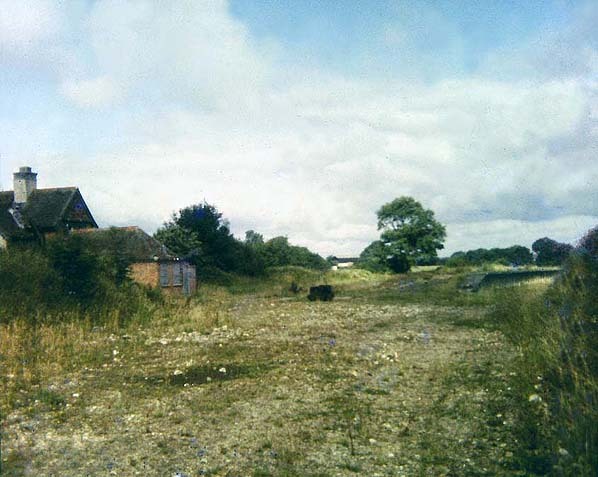 The signal box was also taken out of use and subsequently demolished and the up side platform edging was removed. A camping coach was placed at the end of the goods siding. The station nameboard originally showed Combpyne for Landslip. The nameboard was removed during WW2 and when it was replaced it just showed Combpyne. In the early 1960s a single BR Southern Region green totem sign was fitted to a short post beside the barrow crossing. The goods service was withdrawn from 5 December 1960. 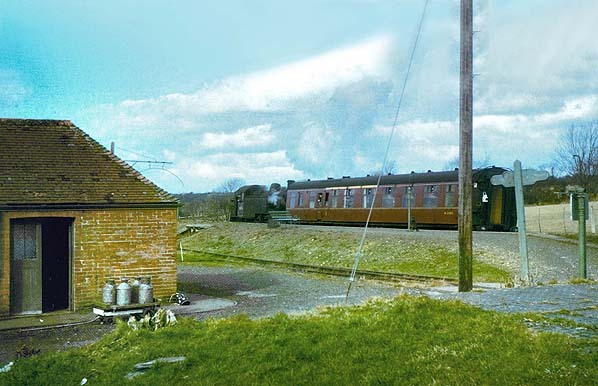 In an article in East Devon Coast & Country (February/March 2013) Mike Clement describes his work as a junior porter at Combpyne station, a job which he began in January 1961, under stationmaster Arthur Causley. In his working week of 45 hours during the winter months he reported to the station on Monday-to-Friday at 8.00 am to do the early turn which ended at 4.10 pm, and on Saturdays at 8.00am to work until 12.10 pm. The late turn was 1.45 pm until 9.20 pm Monday-to-Saturday. 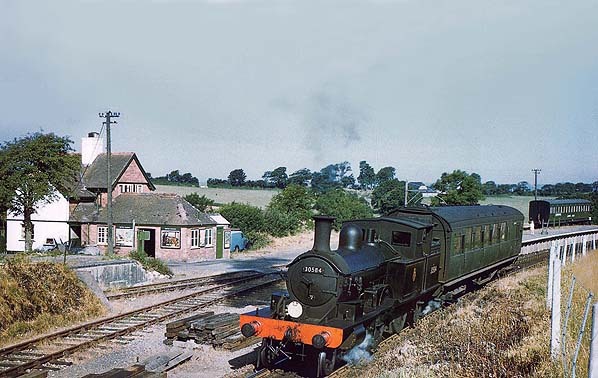 Mike recollects that the station house had neither running water nor electricity, and that water arrived by train from Lyme Regis station in 5-gallon churns, with ten for the station house and a 2½-gallon churn for the booking office. During the winter timetable no trains ran on Sundays, so no water was delivered, and Mike recounts how Bill and Mollie Fowler and their seven children in the station house had to make Saturday’s water last until Monday. Tilley lamps burning methylated spirits and paraffin illuminated the station and the station house. The coal fires in the station house were kept supplied by a bucket of coal from the engine. ‘We never went short at the station’, he remarks: ‘Mollie would cook us a plate of chips, and plenty of tea was brewed’. During the summer months a camping coach was placed at Combpyne, and it did good business. Mike recalls fondly how he and ‘Nobby’, the other station lad, both fancied a teenage girl (‘a real cracker’) who stayed there; but the other, older lad had a car, and Mike just had a bicycle, so Nobby secured the date! 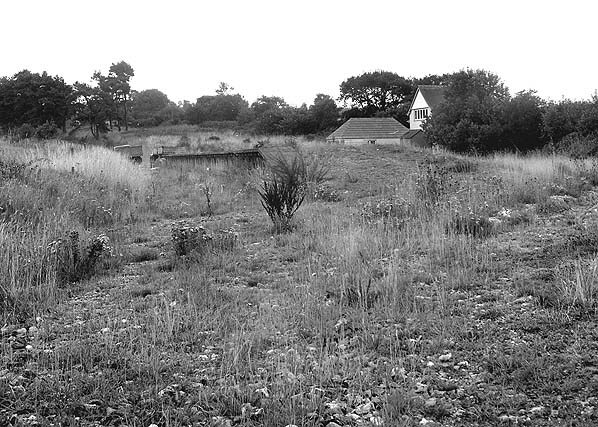 At the western end of Combpyne station was a lengthman’s hut – a shelter for the permanent way maintenance gang. Mike remembers how on one wet winter’s afternoon he was instructed to take a pot of tea to the gangers, who not only let him share their tea but introduced him to Lamb’s Navy Rum with which they fortified their cups of tea. 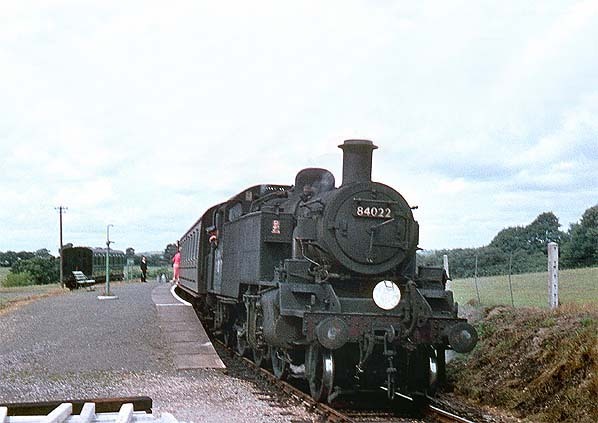 During June 1961, before the summer timetable, Mike recollects that the three Adams Radial tank engines (30582, 30583 and 30584) were replaced with Ivatt 2-6-2 tanks 41307, 41308, 41320 and 41322 which took over working the branch, turn and turn about, from shed 72A (Exmouth Junction). Mike worked at Combpyne until February 1962 when he transferred to Exmouth Junction shed as a cleaner lad. He concludes his account by fondly recalling ‘the laboured beat of the exhaust of one of the Adams tanks as it struggles uphill from Cannington Viaduct, slowly up through the cutting towards Trinity road bridge, and then drifts into Combpyne station, travelling bunker-first towards Axminster with its two-coach train’. In earlier times, Lyme Regis had been a busy sea port, but as larger vessels came into use its business declined. In the nineteenth century railway travel gained importance, and a number of schemes to construct a railway were promoted; these included a line from Bridgwater (on the Bristol Channel) to Lyme Regis, and another connecting Bridport and Axminster or Chard Junction, serving Lyme Regis en route. On 19 July 1860 the London & South Western Railway (LSWR) opened its main line between Yeovil and Exeter, giving the area rail transport to London; a horse bus operated between Lyme Regis and Axminster. The London & South Western Railway and Great Western Railway jointly proposed a branch to the resort but this failed to materialise. In the 1870s the LSWR was ready to support further plans for a branch, but this time only to thwart any proposed competition from the Great Western. The Lyme Regis Railway Company obtained an Act of Parliament in 1871 for a line to Lyme Regis from a junction with the LSWR at Axminster, and the LSWR agreed to work the line. Further proposals were lodged with parliament for a later extension of the line to Bridport. The LSWR's support for the line was only lukewarm and, although construction started on 29 September 1874, it soon stopped again and eventually the powers lapsed. The hilly terrain and sparse population militated against the financial viability of these projects, and a petition in 1898 with 1,630 names inviting the LSWR to build a branch line to Lyme Regis prompted no response. The Light Railway Act came into force in 1896, encouraging the development of more modest and cheaper railway schemes. There was renewed local pressure in 1898. In an attempt to force the LSWR to support the line, and under the Axminster and Lyme Regis Light Railway Order of 15 June 1899, powers were once again granted for a line from the station at Axminster to a site ¾-mile from the town centre at Lyme, with one intermediate station at Combpyne. was let to Baldrey and Yerburgh of Westminster, for a tender price of £36,542; Arthur C Pain was appointed the company's engineer. The LSWR subscribed £25,000 to the cost of the construction and agreed to manage and work the line in perpetuity. It was to take up to 55% of receipts for expenses plus 4% on the cost of works it provided; the owning company would take the balance unless that proved inadequate to pay 4% on the shareholders' £55,000, in which case the LSWR would rebate 10% on through traffic. Construction began on 19 June 1900. The route of the line was sinuous, generally followed contours, and there was only one major engineering feature, the Cannington Viaduct: this was a ten-arch concrete structure 600ft in length with a maximum height of 92ft. During its construction the west abutment and the adjacent pier slipped badly, delaying the opening. Other difficulties during construction contributed to the delay. An extension of twelve months was authorised, and an application had to be made to the Board of Trade for an additional £10,000 in share capital and £3,000 in loans. A special train was run on 22 January 1903 with VIP passengers to inspect the nearly-complete line, but difficulties with the Cannington Viaduct prevented the planned opening at Whitsun. The LSWR arranged a horse-bus connection from Axminster to Lyme Regis in the intervening period. The line was finally passed by Board of Trade inspector Major Druitt on 21 August,opening three days later on 24 August 1903. The first train left Lyme Regis at 9.40 a.m., and at 12.25 p.m. a special train for dignitaries left Lyme, also carrying 200 children whose fare had been paid for by public subscription; the train returned at 1.15 p.m.
Uplyme: the gradient was too steep to permit a station there. The station at Lyme Regis was inconveniently located on the northern edge of the town, because immediately beyond the line's buffer stops the land falls steeply towards the sea. The branch was almost entirely in Devon, entering Dorset for the last few hundred yards before the Lyme Regis terminus . The ruling gradient was 1 in 40 in each direction. It was single throughout, with a passing loop at Combpyne. At Axminster passenger trains were accommodated on the up (north) side of the station in a bay platform, and the line swung south across the main line by a bridge. However Axminster’s goods yard was on the down side, and at first there was a goods line access to the branch line on that side, controlled by two ground frames, one at the yard exit and one at the connection onto the single line, higher up. This required departing goods trains to stop and restart on the steep gradient twice while the ground frame was operated. 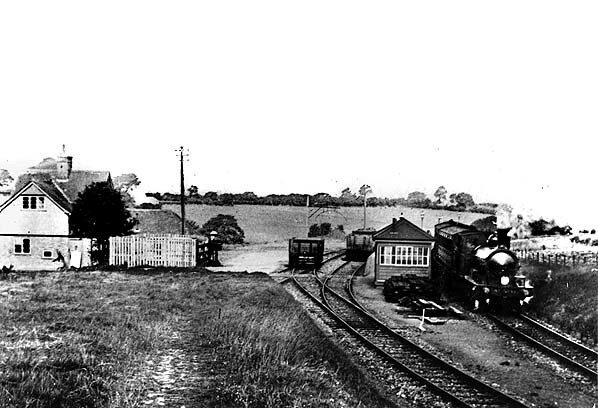 This difficult arrangement was taken out of use on 5 September 1915, after which down goods trains shunted to the up side at Axminster and used the branch line itself. At first the line was operated on the 'one engine in steam' principle, with the run-round and yard points at Lyme Regis operated by a key on the train staff; in 1906 Tyers no.6 instruments were installed, enabling electric train token working, with two sections meeting at Combpyne. The LSWR operated the branch from the beginning. The permanent way was very light, and permissible axle loads were limited to 12 tons. The initial euphoria was sadly unwarranted as the traffic was disappointing, though it proved sufficient to put the local horse-drawn bus and coastal carriers out of business: the train could travel from Axminster to Lyme Regis in only 25 minutes, half the horse-bus journey time. When the branch opened there were six return journeys every weekday. Financial difficulties dogged the light railway, and on 1 January 1907 the company was entirely absorbed by the LSWR which rapidly brought improvements, especially with the carriage of agricultural goods. Two daily return journeys were added, and in 1908 there were nine, of which two were goods trains and one was mixed. Excursions proved popular and through trains to the resort increased steadily. This traffic was severely curtailed by the First World War but resumed in 1919. Summer Sunday trains were put on from 1930, and they peaked at eleven in 1938. The winter Sunday service was discontinued in 1951. In February 1920 buses were introduced between Axminster, Charmouth and Bridport, siphoning off traffic from Charmouth that had used Lyme Regis as the railhead. By the following summer buses connected Axminster and Lyme Regis: a more direct threat to railway passenger traffic which, consequently, dwindled. In the 1950s the public continued to desert the trains owing to the increased use of private cars. By 1952 the Lyme Regis branch recorded fewer than three passengers per train in winter and seven in summer. Excursions continued to sustain the line in summer but during the winter it was uneconomic. Despite this, a reasonable service was maintained with ten down and eleven up trains running in 1961. During winter months a single carriage was usually sufficient, but in the summer there were sufficient passengers for two carriages with a third on those services that had through coaches for Waterloo. The last through workings were in the summer of 1963. On 4 November 1963 steam traction on the branch gave way to operation by a single-car diesel, though at busy times a three-car DMU was used; the engine shed closed at the same time. Passenger numbers were not helped by the inconvenient siting of the terminus, 250ft above and a considerable distance from the town centre. It came as no surprise when closure was proposed in the Reshaping of British Railways (‘Beeching’) report of March 1963. Freight services were withdrawn on 3 February 1964 and the signal box was closed on 20 July 1965, the line once again operating under 'one engine in steam' regulations. The sidings were quickly lifted. On 20 August 1964 the formal proposal of closure had been published and despite local protests, consent from the Minister of Transport, Tom Fraser, was given on 6 September 1965. The final trains ran on Saturday 27 November (Sunday trains having ceased in September, to be replaced with buses). The normally quiet Lyme Regis station was so crowded that passengers intending to catch the 3.39 pm to Axminster were unable to reach the platform. Meanwhile civic dignitaries from Lyme Regis and Axminster were on the train, some sporting period costume, and they enjoyed afternoon tea at Axminster while the DMU returned to Lyme Regis to uplift passengers who had failed to board on the earlier trip. The last round trip left Axminster at 6.48 pm. The line officially closed two days later on 29 November 1965. The track-lifting was completed by 28 June 1967. The wooden main station building at Lyme Regis was dismantled in 1979 and re-erected at Alresford station, on the Watercress Line in Hampshire. The imposing Cannington Viaduct is a Grade II listed structure. 1977/8 through monetary problems and various land issues. The LSWR operated the branch from the beginning; the permanent way was very light and permissible axle loads limited, at 12 tons. The locomotives used at first were numbers 734 and 735, Terrier (A1) class 0-6-0T engines; they formerly belonged to the London Brighton & South Coast Railway (LBSCR) for suburban work. However they were not entirely successful due to their limited power. From 1906, the LSWR’s own O2 class were employed; these were more powerful 0-4-4T locomotives, but they were not permitted to run with the engine water tanks more than half full to remain within the axle load limit, and they suffered badly from twisted frames and other wear defects owing to the sharp line curvature. From 1913, William Adams' design of unsuperheated 4-4-2T engine, the 415 class, usually referred to as 'radial tanks' was brought in. The class had been employed on suburban work in London, and two members of the class were allocated to work on the branch. The trailing axle was designed to move laterally in guides that also rotated it so as to accommodate the curvature of the track. With a modification to reduce the water capacity to 800 gallons to reduce axle loads, these locomotives, built in 1885, proved surprisingly successful. Trials in the 1920s with former LBSCR D1 class 0-4-2Ts and an ex-South Eastern & Chatham Railway P class 0-6-0T were unsuccessful, and the Adams tanks soldiered on. As other members of the class were scrapped because of age and obsolescence, the Radial Tanks became inextricably identified with the Lyme Regis line. (as successor to the LSWR) purchased it back for £800. In British Railways days, there was again concern about the age and maintainability of the now elderly locomotives, and a former Great Western Railway 14XX 0-4-2T no. 1462 was trialled on the branch, but it was underpowered for the demands of the line. In 1959 certain sections of track were renewed and some of the sharpest curves were eased, and the following year a former London, Midland & Scottish Railway 2-6-2T no 41297 was tried on the line (on 18 September 1960), and showed itself to be able to negotiate the curved line. Sister locomotive 41308 visited on 13 November 1960 and was tested with gradually increasing train loads up to six coaches, which she achieved successfully. Having enough power to obviate double-heading of the heaviest trains on the branch, engines of this class took over the work from 1960-1961. Regular steam operation ceased in November 1963 when diesel multiple units took over, although there was a brief return of steam during a shortage of serviceable diesel units: 41291 and a Hawksworth auto-trailer operated the line in February 1965. The following month single-car diesel multiple units arrived and took over until closure of the line on 29 November. Looking west from the road bridge towards Combpyne station in the early years of the twentieth century. At this time the line had an island platform with a separate loop siding alongside. The signal box is seen at the south end of the platform. 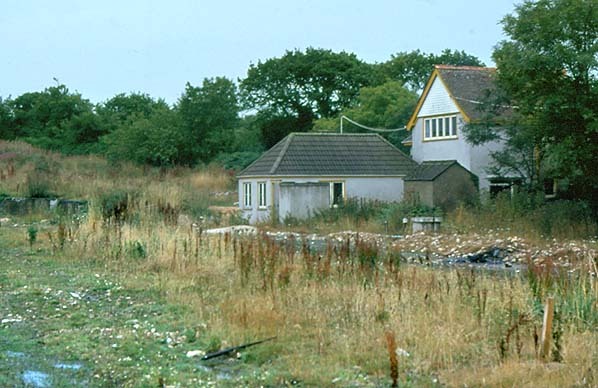 The cattle pen is seen on the left with the booking office behind it. 1904 1:2,500 OS map. This map shows the loop around the island platform but the siding to the west is not shown as a loop; also missing is the signal box at the south end of the platform. The short siding serving the cattle dock is shown with a pen alongside. 1958 1:2,500 OS map. The up line was removed in 1930 with all trains using the down side of the island. Unusually the platform is identified as such. 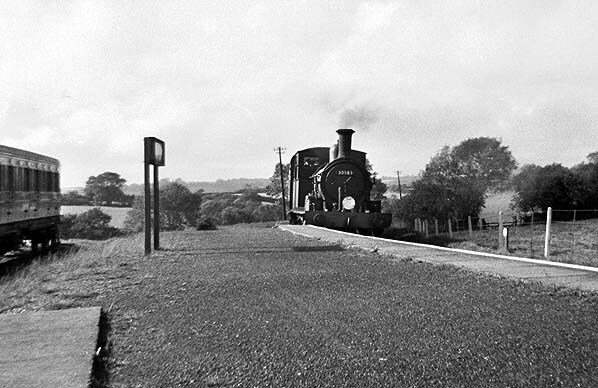 A Lyme Regis train approaches Combpyne station in August 1958. 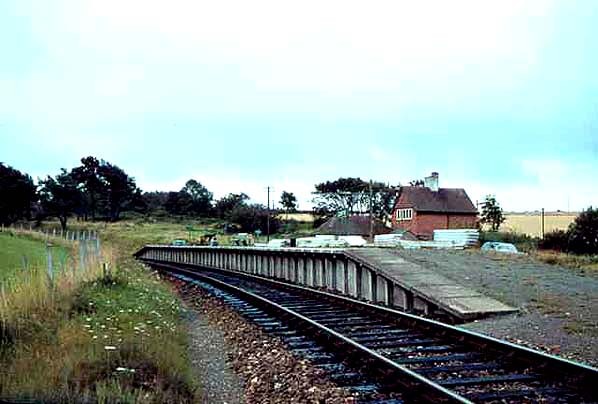 The platform edge on the up side of the former island was removed some time after 1930 when the line was taken out of use. The camping coach is seen on the left. The locomotive is 30583 which was built for the LSWR in 1885 to a design by William Adams and originally numbered 3520. It was one of 72 '0415' class. By 1928 all were withdrawn with the exception of two, nos. 3125 and 3520 which were retained for use on Axminster to Lyme Regis branch. A third engine, No. 30583 (LSWR No. 488, then 3488) was reacquired by the SR in 1946. This had originally been sold to the Government in 1917 and resold in turn to the East Kent Railway from where it was repurchased by the Southern Railway. 30583 was withdrawn in July 1961 and preserved on the Bluebell Railway as LSWR No. 488. 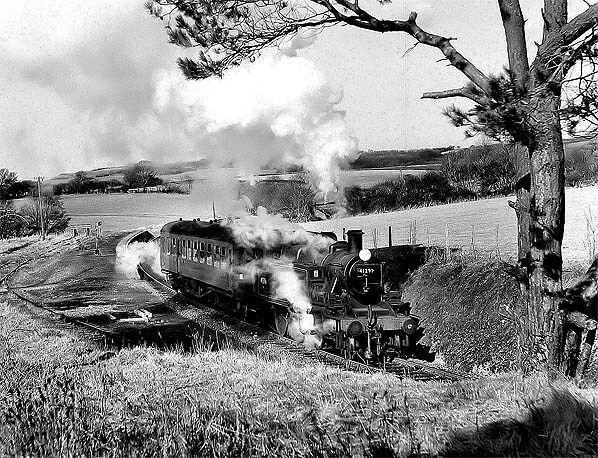 A Lyme Regis train leaves Combpyne station in 1959. 30584 was built for the LSWR in 1885 to a design by William Adams and originally numbered 3520. It was one of 72 '0415' class. By 1928 all were withdrawn with the exception of two, nos. 3125 and 3520 which were retained for use on Axminster to Lyme Regis branch. 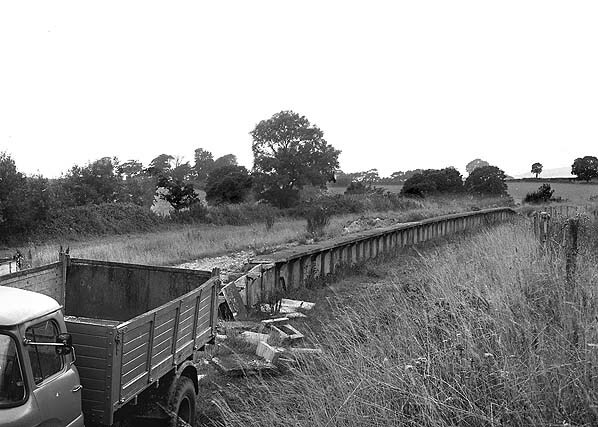 It was eventually withdrawn from Exmouth Junction shed on 28 February 1961 after 76 years’ service. The short siding serving the cattle dock is seen on the left. The cattle pen had been removed by this time and goods service were withdrawn the following year. A Lyme Regis train awaits departure from Combpyne in August 1961. 84022 was one of a class of 30BR2/2 built at Darlington works in 1957 to a design by Robert A. Riddles. It had a very short life, being withdrawn to Crewe works in September 1964 where it was cut up a month later. Combpyne station looking south in August 1963. The platform never had any facilities; by this time the platform lighting and running-in board had been removed. Combpyne booking office and stationmaster's house in August 1963. Passengers had to cross the sidings to reach the platform. At this time the only sign identifying the station was a single BR Southern Region green totem on a post opposite the booking office. at Crewe works in 1952. Combpyne station looking north c1967. Combpyne station and goods yard looking north c1968. At this time the booking office and adjacent house were unoccupied. Combpyne station looking south c1970. The booking office and stationmaster's house seen in the distance have now been renovated and are in private occupation. Combpyne booking office seen from the platform in August 1977. After removal of the concrete edging all that remained of the platform was an earth-and-cinder mound. Combpyne stationmaster's house and booking office in January 2006.